“Who is Small Pet Select, and what’s all the fuss we’re making about timothy hay for rabbits, guinea pigs and chinchillas? Well, in a nutshell, we’re a small operation run by pet owners for pet owners– just like you – and we specialize in delivering the highest quality timothy hay for small pets; fresh and directly to the door of owners throughout the continental U.S. We hand select the timothy hay and focus on purchasing only the very best quality hay for rabbits, guinea pigs and chinchillas – soft, green and fragrant, just the way they love it. I love supporting smaller businesses and getting my head out of Petsmart and Petco, even though sometimes you still end up in one. The guinea pigs absolutely loved the hay, as did Tom, who was not supposed to be eating hay with the guinea pigs that day. If he keeps this up I’ll have to nickname him Timothy instead of his Gargoyle moniker. 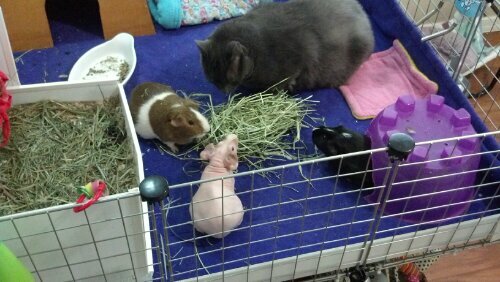 (whisper) cats can’t really digest the timothy hay, but the scent got him and the texture taunted him and he couldn’t resist. Guinea pigs, bunnies and chinchillas’ teeth are constantly growing and they need unlimited hay available to wear down those teeth to avoid or delay those costly dental trims ! 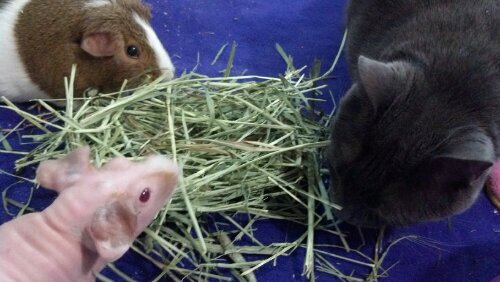 A strong, fibrous hay is a must. … right at my door…for my girls ages 4, 6 and 2… and Tommy Gargoyle. It’s not mine yet but it could be.